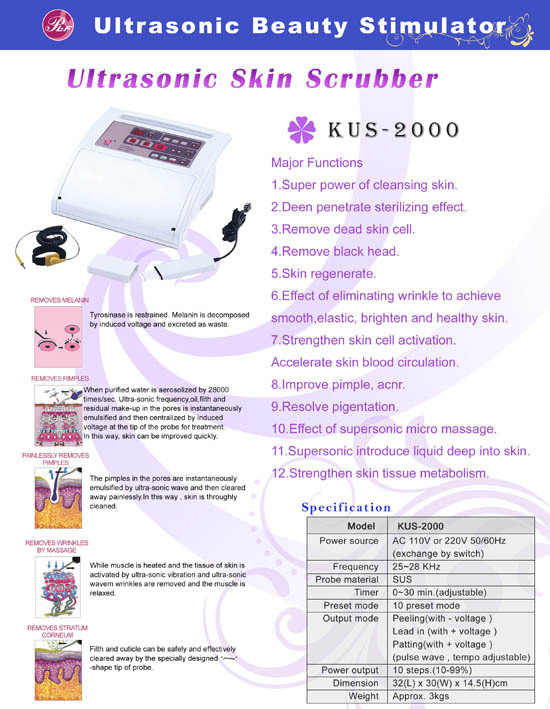 Taiwan Ultrasonic Skin Scrubber (KUS-2000), Beauty Equipment, Skin Care Machine - Palifull Co., Ltd.
1. Super power of cleansing skin. 2. Deen penetrate sterilizing effect. 3. Remove dead skin cell. 7. Strengthen skin cell activation. 10. Effect of supersonic micro massage. 11. Supersonic introduce liquid deep into skin. 12. Strengthen skin tissue metabolism.